I’ve encountered my ideal protagonist! It’s my friend, Hinomori Ryuuga. We’ve become the closest of friends after entering high school. My first impression of Ryuuga was “This is the kind of protagonist you’d see in something like an anime.” Then, that thought soon changed into conviction. …So why am I doing this? That’s because I, Kobayashi Ichirou, am a pro at being a friend. My life’s calling is to support Hinomori Ryuuga, the protagonist amongst protagonists, as a close friend character. ―Let the curtains open for the rom-com presented by co-starring best friend, Kobayashi Ichirou! This is a great novel at first if you read "The power behind the shadow" novel you can see some similarity here but sadly as the novel progress the author had a sudden wrong turn that complete lost the very essence of the novel. First the concept of MC role wanting to be a support character for his ideal main character was good even the concept of supporting some heroin for the hero is exceptional. But sadly for some odd reason it went from diamond to complete garbage. One reason is at first... more>> the MC was exceptionally amazing from planning to scheming you can say that it was entertaining but as the chapter progress the MC went from genius to retarded. I suppose this all started when the Totie Spirit Possession, The MC character became GARBAGE and I mean literary Trash Character. MC was of being NTRed by the Totie was already a huge MINUS. Then he still push his dream as a support character in the most retarded way. He have a harem in his house yet barely have an impact. Even his relationship with the other girls seems idiotic as the Totie keep on replacing him especially in romantic moments like dating. I don't know if the author just love NTR or something but the Totie character just is annoying in my point of view. Imagine one of the scene where the Totie has a date with one of the Heroin and MC just watch at the distance where Totie promise this and that and made the girl in love with the MC because Totie has the same appearance with MC. While since it's japanese novel where MAJORITY is a HAREM no TOUCH genre but with the idiotic ROMCOM approach it made me give up on this novel. The Battle is repetitive and boring almost no originality. Their is no element of surprise what so every that made you think of something or make you expect of something. This novel started out being very interesting to me however, volume 2 was just uninteresting. it feels like the author planned out to volume 1.5 but ended up rushing the rest. It feels subpar and boring and Jesus they just start tossing characters around to the point that the harem is a. Too big and b. Not believable. Not like most harems are but this one just doesn’t work at all. It's good so far, but what I've seen might be a little polarizing later on. Seeing the cover art, I thought, ah, this "protagonist" he's supporting is probably a woman. I mean, the shading around the chest only reinforced the fact. Then I saw the illustrations. Yes, he is a she. At the later parts, it also seems like he moved to being the protagonist of some SoL harem story instead, so I believe that you are probably being mislead. But if all you are looking for is the comedy, it is good so far. Really nice and some meta jokes that are not quite fourth-wall breaking. You really feel the MC (the perspective character, not the character he calls the MC) working hard. And he's secretly high-spec to boot. Overall, it looks like it will be at least decent. As usual, there may be spoilers in my review, but nothing much to say here other than - I NEVER KNEW I NEEDED THIS. WELL. MAYBE I DID. Because honestly, I always loved the side characters of harem shows and reverse-harem shows, and I always have a special spot in my heart for the supporting best friend character. And he's self-aware too? The downside is... it doesn't stay that way. It's gradually growing more generic devolving into a standard rom-com LN, and though I didn't mind the lack of (actual) plot... more>> in the beginning, it doesn't hold my interest. I wish the MC remained as a side-character, but what made him (and Ryuuga, for that matter) initially unique is getting lost. Honestly I don't wanna be that guy but I just really really HATE taotie. He ruins this novel for me. I know that the author already addressed the Ntr situation but still.... If you're a sensitive b**** like me then you might rage thanks to taotie. 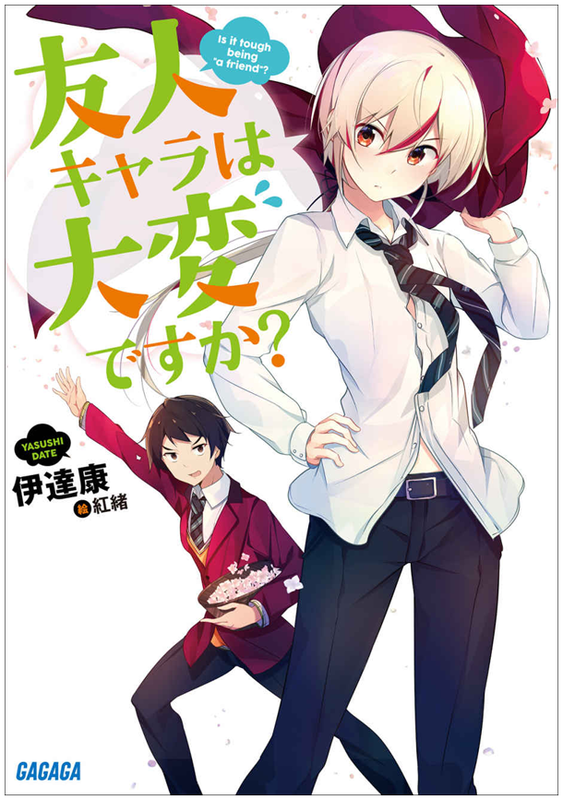 However, it still is a pretty funny light-hearted novel and I would definitely recommend you read the first volume. This novel starts off really good but then it baits and switch into something else. In my list, mocking and referencing cliches are always well received. So when I read the premise of the novel I knew I would like it. And, for the first volume, it was mostly true. The MC is a guy obsessed with being a best friend side-character. And because of that he will always try to highlight the 'protagonist' and will use some common cliches to create or even force his ideal setting for the... more>> 'story'. This is where most of the comedy (the good one at least) comes from. Only first chapter so far, but it feels like a breath of fresh air. MC's passion is to bring up the talents of others, but there are hints that he's pretty talented himself. For now it's pretty amusing. Only the first chapter is out but I'm already enjoying this its really funny! This is early for a full review, but there's some potential for an amusing read here. The passionate way the MC wants to support someone else into the limelight is quite funny, despite him in actuality being far superior to all of his previous "main characters". ... when the obvious girl crossdressing as the ideal Hero, Ryuuga, was revealed to be a girl within the first two chapters to the MC. I was expecting that to be a recurring gag and somehow sidestepped by a bunch of different tropes as excuses, such as it being a gender bender curse or a potential twin sister or what-have-you whenever it got brought up. Interesting premise, so far it's been fun and I've always had a soft spot for side characters over main characters, though he's reasoning for being a side character is questionable. I especially can't wait for the protagonist to learn the truth. It is a trope parade breaker, guy pretends to be a pervert but seems to have an existential block that prevents him from ever going the distance. Usually you get dense, he is fairly observant and aware of the others feelings, or super pervert he is perverted for cosplay but not to a high degree. second, he is aware of the tropes honestly he reminds me of Deadpool a little, he semi-breaks or fully breaks fourth wall when... more>> he monologues. He also is human and superhuman, he has a lot of stupid skills he still doesn’t realize he is MC level OP. Like others have said. This novel is a bait and switch. The summary had me completely fooled and while the plot twist was kinda unexpected. I didn't really like it and the plot soon became generic afterwards. This wasn't what I had signed up for. Such a shame too since the original premise was kinda unique and plenty fun. I had fun reading this novel, although sadly there is not enough material to read and properly judge it (at least translated material). I was able to enjoy myself and have a couple of laughters along, but sadly after volume 1, the story seems to be getting messy, I can't see the direction is taking. Although if we ignore the "story", and how generic the characters are, it is still a fun reading. there is nothing special about any of the characters, they are predictable and I have yet to see any "growth", they are two-dimensional. They are characters you would see of your average romcon. Just like the characters, the plot is pretty much generic, the only difference is that we see it from the perspective of a "side" character which makes it a bit more interesting. The protagonist of this novel is what makes it fun and enjoyable. His inner monologues along with the way he acts with the characters is pretty funny. Although he is not completely original, he is still better than a two-dimensional characters. My only problem with him is that we have yet to see his "true" self, after all, he created a persona to go along with the "story". Sometimes we see him getting out of character and maybe showing the true him, but he has yet to totally discard that persona. not much to say about this, is pretty average. Like I said before, the MC is what makes this story fun to read. Well, that's it for now, it saddens me that the translator stopped working on this novel but I comprehend. I'm a sucker for these metastories, and particularly this one reminds me of a story I wanted to write myself about the Eternal Supporting Character. But there's a bit of these stories, now, so you can pretty much expect the usual; but still, this one is plenty amusing. Basic premise: a supremely genre-savvy character caught in their own prejudices, trying to keep a story on track that just isn't going to happen, Ichirou. Some self-aware harem hijinx ensue, but as a parody it's pretty much fast-forwarded.